FOR A FESTIVAL FOCUSED ON THE DANCING BODY, DANCE MASSIVE PROVIDED SURPRISING SATISFACTIONS FOR THE EAR. WHILE CUNNINGHAM AND CAGE, ALONG WITH RAINER AND FELLOW 60S AVANT-GARDISTS, FOUGHT AGAINST OR SOUGHT BEYOND AN ESSENTIALLY EXPRESSIONIST RELATIONSHIP BETWEEN MUSIC AND DANCE, THE LURE OF THE EMOTIONALLY CHARGED UNION OF SOUND AND MOVEMENT IS HARD TO RESIST. MOST WORKS IN DANCE MASSIVE OFFERED SOUNDTRACKS THAT, IN CONCERT WITH LIGHT AND DESIGN, PROVIDED THE EMOTIONAL WEIGHT AND ATMOSPHERIC TENOR OF THE WORLDS INHABITED BY THE DANCERS. HOWEVER A VARIETY OF METHODOLOGIES WERE DEPLOYED, IMPLICITLY INTERROGATING THE RELATIONSHIP BETWEEN SOUND, MOVEMENT AND MEANING MAKING. Of course a direct and intense way to integrate music with dance is for the sound to be produced live, a tactic several of the works exploited. Its most breathtaking realisation was found in No one will tell us… Here the guitarist, Swiss musician Hansueili Tischhauser, literally played with the dancers, Rosalind Crisp and Andrew Morrish, prowling the stage, adopting and responding to their gestures, all the while musically shaping the tone of the improvisation. 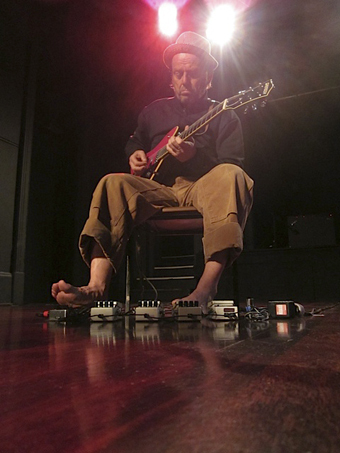 With effortless precision he used looping and effects pedals to create a range of atmospheres from elaborate carnival capers to sparse and haunting John Fahey-like meditations, to joyous propulsive blues grooves. Here Tischhauser’s presence, as well as his sound, was an equal performative force in the trio, and in the performance I experienced, everyone was on fire. 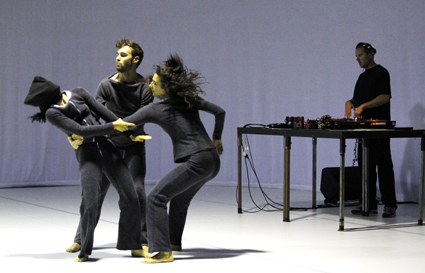 Composer/turntablist Lynton Carr’s presence was similarly strong in BalletLab’s Amplification. Placed prominently on stage, Carr was lit for the entire performance, allowing us to witness his dexterity as he manipulated a vast range of vinyl into a cohesive soundtrack. Most often, and in keeping with the thematic of the work, it is a harsh and brutal score, the very gesture of ‘scratching’ implying force and abrasiveness, creating abrupt snatches of sound sampled from sources as disparate as Stravinsky’s “Rite of Spring” to Nico & the Velvet Undergound’s “All Tomorrow’s Parties.” At its most lyrical we entered the world of illbient—loping bass beats and dreamy atmospheres; we are literally caught in the loop. Phillip Adams’ choreography exploits the energetic properties and often the cultural associations of the sound without in essence directly dancing to it (a ‘balletic’ “Rite of Spring” scene excepted). Amplification was first performed in 1999 when the presence of a live DJ would have been quite new. While some in the audience thought the turntablist sound dated or nostalgic (maybe I’m out of touch but isn’t mixing vinyl still a pretty current phenomenon? ), the virtuosity of its execution and the dynamism that it injected into the work were exceptional. Noisician Hirofumi Uchino was firmly embedded in the structure of Branch Nebula’s Sweat as a worker and artist. Ten minutes into the show, as an example of the work’s focus on labour, his entire sound system was rolled in and set up from scratch, part of an evolving transition from the ‘real’ to ‘theatrical’ space. For an artist whose genre is most often associated with aggression and extreme volume, Uchino and directors Lee Wilson and Mirabelle Wouters exercised surprising restraint. Many moments of silence emphasised the power imbalance of the audience-performer dynamic. When we did get sounds, they were dark, verging on threatening without being melodramatic, occasionally funky with beats made from digital detritus, and on the whole avoided any figurative palette. Uchino’s disorienting static scattering around the room from a parabolic transmitter was particularly unsettling over the infamous dinner party scene. My one quibble is that in a show that allows each worker/performer to display their particular skill, there was no moment focused specifically on Uchino’s prowess. The first sonic statement in The weight of the thing left its mark, directed by Shaun McLeod, was the delicate song of a currawong, heard at such a distance as to seem recorded. We turn to the musicians Madeleine Flynn and Tim Humphrey, seated at a table at the edge of the space, and they smile. They cannot take credit for this quite magical moment in a piece that is all about being in the moment. What they do create is based on the same materials wielded by the performers: common cutlery and kitchen utensils. Flynn scrapes forks over surfaces, strikes a metal mixing bowl and decants dry grains between cups, all closely miked and processed by Humphrey to pull out the ring and the sing of the object. It is just sparse enough, just varied enough to make a delicate environment for play for the dancers whose bodies search through improvisational sequences. Out of place is the moment in which a wheat bag is cut, the grains pouring onto a corrugated iron sheet—the scale of the gesture indicating a significance that has little correspondence (either in a unifying or antagonistic way) with the onstage action. 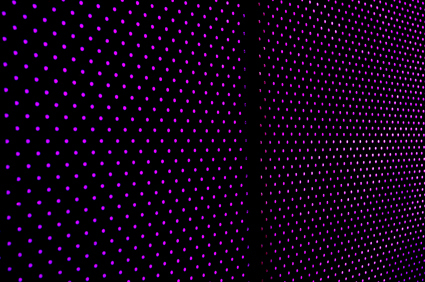 Flynn and Humphrey also have an installation at Dancehouse titled Music For Imagined Dances, which is essentially a listening room that plays a random 25-minute selection of music (see RealTime interview). With a dynamic design by Nik Pijanti that places moving lights behind pin-holed sound attenuation material, the space is infused with shifting colours and patterns making an elegant, contemplative environment. However the range of pieces—from tracks composed by contemporary Australian composers (some for real dances, some imagined) through to iconic dance compositions by Stravinsky, Cage and Feldman, through to tracks by M.I.A, Nirvana and Radiohead—seems too broad. Music For Imagined Dances declares that all music can be danced to in your mind, which is of course true, but doesn’t some music conjure a stronger imaginative kinetic response? For me the material lacks the focus to engage us more deeply with its lovely proposition. For Matthew Day’s Thousands, composer James Brown takes his place behind the audience, but his presence is by no means diminished. Offering a unified, almost monotonous sonic palette Brown concentrates on the visceral effect of the music, his hyper-panning of sub-frequency growl unsettling our very organs and giving us a real physical empathy with Day’s muscular tremors as he incrementally moves through a slow rotation over the course of 45 minutes. Even as Donna Summer’s disco classic “I Feel Love” surprisingly emerges from the rumble, Day still does not dance to the music, rather it gives him something against which to fight harder—music as obstacle to dance. Curated in a double bill with Matthew Day was Deanne Butterworth’s Dual Repérage in Threes with sound by Michael Munson. Here, the relationship with the music is most intriguing at the beginning where Munson creates a spacious environment for Butterworth to inhabit rather than dance to, using cavernous chords with strong attacks and long delays. As the piece progresses, more rhythms emerge, offering Butterworth more drive to draw from. She slips between dancing to and living with the sound, the latter mode allowing for more nuance. In Michelle Heaven’s Disagreeable Object, Bill McDonald’s soundscape also provides more environment than accompaniment. Interestingly, in a video interview with RealTime, Heaven mentions how the piece was initially created without music, working only with the rhythms of the movement. McDonald has respected this by creating a sense of nostalgia by using scratchy gramophone records and adding ominous tones that hover just below the action, maintaining the arch gothic ambience of the work. In addition the team has worked to highlight particular diegetic effects, miking the sounds of crunching, swallowing, snuffling. Heaven also vocalises the sounds of objects—a tap turning, the squeak of tea trolley wheels—creating a cartoon effect that adds extra quirkiness to this ingenious little gem of a work. A particular sonic pleasure was the collaboration between Robin Fox and Oren Ambarchi for Chunky Move’s Connected. Each an undisputed master of Australian experimental music, together they created an epic score of tension-filled spaciousness between a series of ever increasing crescendos—Ambarchi providing lurching drones of fulsome harmonies, Fox delivering hard edge statics, underrumbles and tingly spatter. Structurally the role of the music here is what we have come to expect. It propels the dance, holding the energies in check and then releasing them, unabashedly manipulating our response through a series of smaller climaxes to the final one. Robin Fox also provided the sound for Antony Hamilton’s Drift which was played drive-in style through the stereo of the vehicle in which you also viewed the work. Fox’s material, rich in bass, is somewhat challenged in this listening environment (although some audience members might have had a pumping car stereo system that could cope). A highlight is the inclusion of material from a collaboration with improvising bassist Clayton Thomas, with percussive, rubbery plunking and complex rhythmic interplay that sits uneasily but interestingly over the street-inflected dance. But the tone of Drift as a whole was perplexing—was that extended primal drum sequence with accompanying flailing dance in earnest? The irony was hard to read, disconnected as we were from the action in our metal capsules. Huey Benjamin has created vast amounts of intricate and detailed digital material for the score of In Glass by Narelle Benjamin, much of it very beautiful, but constantly shifting, moving on. I longed for fewer layers, more space, more moments of repetition and pattern making, more dynamics (the soundtrack is compressed to the limit) in order to grasp the many territories and ideas that both Benjamins are working with. It felt as if there needed to be more trust in the dance itself, freeing the music from its parallel role of exposition and allowing it to bring more oblique lyrical space to the work. Livia Ruzic’s sound design for Trevor Patrick’s I Could Pretend The Sky Is Water seemed subtle in comparison with the music-drenched works in Dance Massive but it was no less effective. In a heavily text-driven work, with Patrick’s recorded voice-over alternating between an older and younger self and full of poetic remembrances and curious philosophising on the nature of choreography and art-making, Ruzic’s spare additions of water droplets, fire crackle and subtle tonal washes were subliminal and dreamlike. She offered unobtrusive, egoless support absolutely vital to the ambience and momentum of the piece. Finally, to the sparest sound design of all, found in Luke George’s NOW NOW NOW, where in fact, at some point in the creative proceedings the choreographer chose to do away with a sound designer altogether (see RealTime interview). The majority of sound was made by the performers themselves, either through rhythmic chanting of ‘ow’ words or in their laboured breathing after an extended sequence of high kicks, or disconnected phrases mimicked from a silent TV screen. The only recorded sound was a piece of non-descript pop music played from an iPod that triggered a pivoting jazz-dance sequence. Meanwhile, uncomfortable silences brought us back, time and time again, to our awkward present. But, of course, as John Cage counselled, there is no silence and, on the night I attended, traffic noise, sirens and a large blow fly kept us very much aware of ourselves, and the dancers, in the here and now. While the majority of experimental music and sound practice in Australia operates in isolation—without a body, without performative or overt gestural distraction—it is exciting to see more cross-over and cross-disciplinary exploration developing, evidenced by much of the work in Dance Massive. With the recent Australia Council Music-Dance initiative which is encouraging a bi-partisin approach to funding dance with music, or music with dance, hopefully the dance sector will become even more adventurous in its level of sonic experimentation (and vice versa) with the conversation between music, dance and performance becoming even richer, more complex, and more daring. My schedule prevented me from seeing Happy as Larry (composers Nick Wales, Bree Van Reyk ), Not in a Million Years (Max Lyandavert), Sunstruck (Livia Ruzic), Becky Jodi and John (Hahn Rowe) or Dance Marathon (Ciara Adams, Richard Windeyer).